US District Court Magistrate Judge Nandor Vadas ruled that the National Marine Fisheries Service (NMFS) did not consider scientific data of long-term effects of sonar testing on marine life when permits for the Navy were approved in 2012. Vadas pointed out the initial review was “improperly focused on a narrow window of time to gauge the potential effects” and that consideration of long-term effects should prompt a reassessment of the continuation of the testing. In defense, the Navy claims they conduct testing in open waters off the coast of Washington State by a single warship for less than 2 hours at a time. They maintain that this sonar testing is not a danger to marine life. The National Resources Defense Council (NRDC) has a petition to bring awareness to the killing of whales “from deadly sonar”. Not mentioned by the US Navy is the fact that these sonar tests are actually technology used to search for underwater petrol deposits – just as is done off the coast of Madagascar. 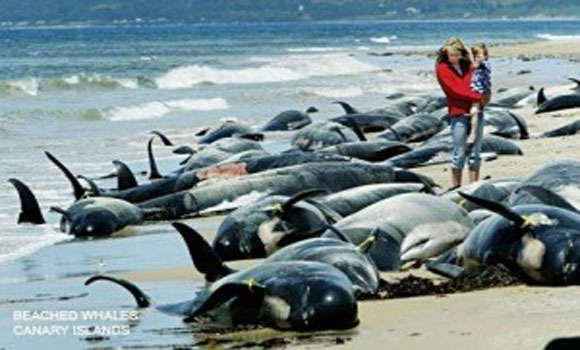 This endeavor for more oil preformed on the behalf of ExxonMobil caused 100 melon-headed whales to beach themselves. Well this is a perfectly reasonable and acceptable reason to explain the genocide of mammalian marine life. These “beachings” could be the result of criminal like weapons testing being done haphazardly in the Planet’s oceans. Do not blame the Japanese completely fro radioactive deaths of marine life when the Stuxnet virus was found in Reactor #3 control systems. That Virus was created by MOUSSAD the Israeli para military. Just like it was determined that WTC building 7 was wired for demolition by MOUSSAD as released by the US Army War College. If one was wired for demolition THEY ALL WERE. Let us not forget the “dancing Muslims” who were arrested on 9/11 for filming the first airplane hit starting a full 15 minutes before it happened. Their rejoicing and dancing after the first strike confirmed suspicion. However after their arrest they were released when it was determiner that they were MOUSSAD Agents dressed as Muslims. Released even though bomb sniffing dogs alerted on the rental van they were using. How come of all the senses COMMON is the least used? · Gentiles’ flesh is as the flesh of asses and whose issue is like the issue of horses.